The construction, probably under Emperor Theodosius I or Constantine I, was converted to a Christian church in the 4th century, dedicated to the incorporeal church which temporarily served as a Metropolitan Church and was decorated with mosaics. In the period of Ottoman occupation by the Turks the construction served as Eski Metropol (Old Metropolis). In 1590 the Rotunda was converted into a mosque (Hortaç Efendi Camii) and a minaret was added to the building; treasures and icons were taken away to the small Georges Chapel, to the West of the Rotunda. 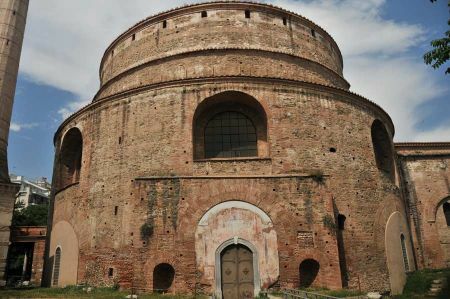 As in 1912 Thessalonica came under Greek rule, the Rotunda was changed to church again, but in 1917 to the Macedonian Museum. Just the minaret was preserved as a single one in Thessalonica. In 1978 the building was damaged by an earthquake and was restored and renovated since then. In 1999, the Rotunda was reopened as museum-monument, although the Greek Orthodox Church still raises claims on the construction. In the eastern apse is an altar again. The mosaics of the Rotunda are considered the oldest wall mosaics of the Christian East. Some of them are purely ornamental (octagons with birds and fish in East African style, intersecting circles in the West African style, carpet-like divided in the southern corner. The dome mosaics on an golden basement are split in three areas: 15 obtained martyr figures in wide robes (including Ananias, Romanos, Aristarchos, Kyrillos, Basiliscus, Leon, Philip, Priscus, Cosmas), with sitting peacock busier simulated architecture with acanthus leaves and ornament strips, fragmentary apostles and angels and triumphant Christ. Something unfortunate for visitors are the opening times which hardly allow multiple buildings on a day to visit. About this first inquiries should be made, because no later than 15.00 clock most of museums and attractions are closed again.